Contacts with the Galactic Core have a certain elusive quality: insights can be forgotten if not somehow documented. Mercury’s conjunction today could have a more substantial and lasting effect. For one thing, Saturn is nearby. For another, Mercury is slowing down: it will only continue for six days before stationing retrograde. Today’s Birthdays: Fanny Kemble (1809-1893), William Bliss Baker (1859-1886), Katherine Milhous (1894-1977), James Agee (1909-1955), Al Jackson Jr. (1935-1975), Gail Sheehy (1937), Bruce Lee (1940-1973), Marilyn Hacker (1942), Jimi Hendrix (1942-1970), James Avery (1945-2013), Kathryn Bigelow (1951), Bill Nye (1955), Samantha Bond (1961), Twista (1973), Alison Pill (1985). Whether or not you live in the U.S., I hope that you discovered many reasons to feel thankful this past weekend despite the ongoing pain and chaos in the news. While we all experience moments of grief and fear, there is also an incredible amount of beauty and kindness and love in this world; sometimes it takes special effort to redirect one’s attention to it, however. Short of viewing Earth and its struggles from space, there are other ways to get some perspective. 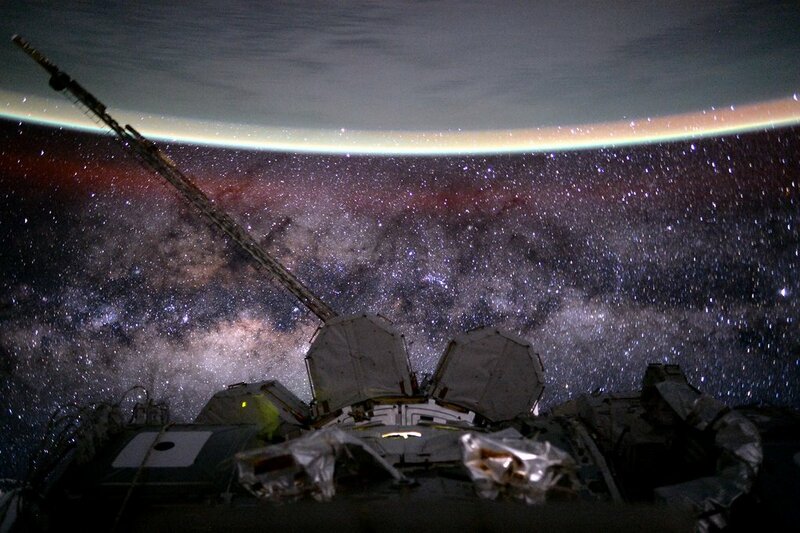 Photo of Earth and the Milky Way (Galactic Core) from the International Space Station by Scott Kelly / NASA. Some of this week’s astrology is building toward aspects that may increase your sense of tension and frustration; specifically Mercury stationing retrograde and a Full Moon. Yet there are important mitigating factors along the way. For example, beginning the week we have the Mercury-Saturn-Pholus-Galactic Core conjunction in late Sagittarius. This is the astrology that last week’s Astrology Diary highlighted. This is the aspect pattern that is urging you to remember you are an adult should you happen to meet someone whose parental posturing threatens to trigger you into reacting like a child. The Galactic Core is offering the message that you have the power to stand in your truth. Moon Phase: Moon is in First Quarter phase and enters Waxing Gibbous phase on Nov. 30 at 1:27 am PST / 4:27 am EST (09:27:05 UTC). Next Full Moon is in Gemini on Dec. 3 at 7:47 am PST / 10:47 am EST (15:46:54 UTC). Corresponding New Moon in Sagittarius is on Dec. 17-18 at 10:30 pm PST / 1:30 am EST (06:30:20 UTC). Moon Sign: Moon is in Pisces and enters Aries on Nov. 28 at 8:30 am PST / 11:30 am EST (16:30:10 UTC). — Mercury conjunct Galactic Center at 10:38 am PST / 1:38 pm EST (18:38:06 UTC). — Mercury trine Pallas at 11:39 am PST / 2:39 pm EST (19:39:28 UTC). — Mars square Juno at 4:21 pm PST / 7:21 pm EST (00:20:52 Nov. 28 UTC). — Mars opposite Eris at 6:55 pm PST / 9:55 pm EST (02:54:42 Nov. 28 UTC). Identify the kinds of doubts that eat away at your confidence, and address them directly. Most people you know are still caught in the same fears they were five or 10 or 20 years ago. You are embarking on a major new phase of your life, and you can only go forward from a place of actual self-esteem. Be bold about challenging beliefs instilled in you by your family. Contacts with the Galactic Core have a certain elusive quality: insights can be forgotten if not somehow documented. Mercury’s conjunction today could have a more substantial and lasting effect. For one thing, Saturn is nearby. For another, Mercury is slowing down: it will only continue for six days and a couple more degrees before stationing retrograde. It won’t reach the Galactic Core again until Jan. 8. If you feel like an inspiration is near but not yet connecting, give it time to come through in full color. You’re likely to find it worth the wait.